If you are looking for guardian angels pictures, you’re in the right place. Here you will find a small collection of pictures portraying guardian spirits. Images of guardian angels offer comfort, radiate beauty, and evoke a sense of peace. Pieces of artwork depicting guardian spirits make lovely decorative pieces as well. 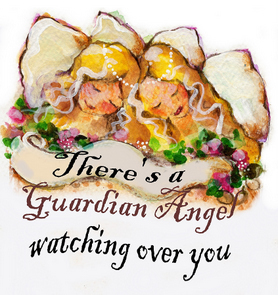 By the way, the guardian angel pictures shown below make wonderful gifts for people who love angels. And stretch the ties that bind? Guardian angels are serene yet they are very powerful. They can comfort you with their loving presence. At the same time, they will protect you from the dangers both seen and unseen. The belief that angels are all around us gives us comfort. If you ever feel lonely, isolated, abandoned... call on the angels. They never leave your side. Angels respect our free will. They will never interfere in our affairs unless we invite them into our lives. So never hesitate to ask for the help of your guardian spirits.